12% of all sales go directly to our Scholarship Funds. DO NOT USE THE THE YELLOW BUTTON BELOW. USE THE ORANGE BUTTON ABOVE. 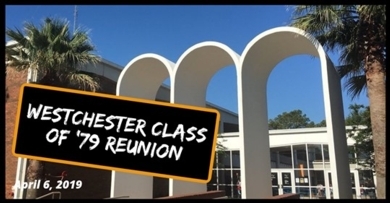 Hey Westchester Class of ’79, are you ready to celebrate? We’ve planned an amazing weekend full of fun activities and lifelong friends, so check out the schedule below and buy your tickets soon! 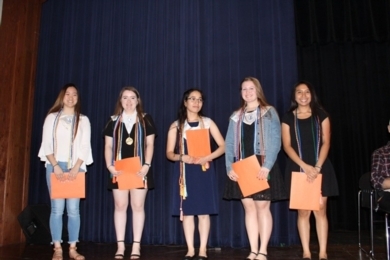 The Westchester Alumni Association awarded six Westchester Academy International School graduating seniors $1,000 each at the Westchester Awards Night on Tuesday, May 15, 2018. Class of 2018 Scholarship Recipients! Congratulations to these exceptional seniors! Applicants were evaluated on academic merit, ACT or SAT scores, extracurricular activities, awards, and community service. Since 2007, the Westchester Alumni Association Student Scholarship Fund* has awarded $72,000 to 72 deserving, college bound Westchester Academy International School graduating seniors. *Donations to the scholarship fund are accepted all year from Westchester alumni and corporate sponsors. 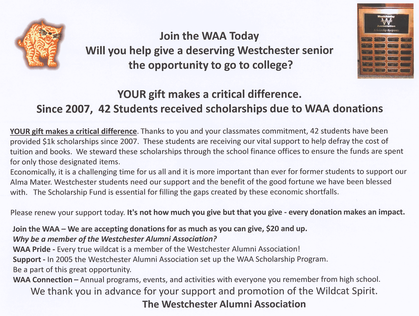 To make your donation to the scholarship fund please visit www.westchesterwildcats.com and click on Scholarship Donation. The Westchester Alumni Association was estalished in 2005 to unite all Westchester Senior High Schools and Westchester Academy for International Studies alumni. Members have the opportunities to connect with former classmates to support our scholarship programs and conntinue thier Wildcat Pride! If you wish to make a donation to the Westchester Alumni Association's Student Scholarship Fund please follow the instructions below. Electronic tax deductible scholarship donations may be made online using a credit card by clicking the orange button below. After clicking on the button you will be transferred to a webpage hosted by the Spring Branch Independent School District. A list of donation choices will appear on the webpage. The Westchester Alumni Association Scholarship Fund (WAA) is the 8th item on the list. Please click the donate button beside the WAA name and follow the further instructions on the site. You do not need a PayPal Account to donate you can use your personal credit card. Westchester Academy for International Studies two finalists in this category Adam Kassir and Jabob Saenz. To earn this highly regarded recognition, students must be at least one-quarter of Hispanic/Latino descent, attain a high performance level on the PSAT, and have a GPA of 3.0 or higher at the end of their junior year. About 5,000 students nationally earn this recognition. Westchester is now authorized to offer International Baccalaureate (IB) Programme for Grades SIX through Twelve!! Only 13 schools in the state of Texas offer both middle school and high school programs. Many consider the IB curriculum the best curriculum in the world. Shaun Wegscheid (a Westchester grad and now faculty member at Westchester) worked alongside many other Westchester staff members to bring this excellent opportunity to Westchester students.